We know we can’t solve all the world’s problems. But we can do something. And you can do something, too. All it takes is one step. If we take that step together, we can help people in our communities and around the world overcome some of the difficulties that affect their well-being. Twenty-percent of Iowa children don't have enough to eat. 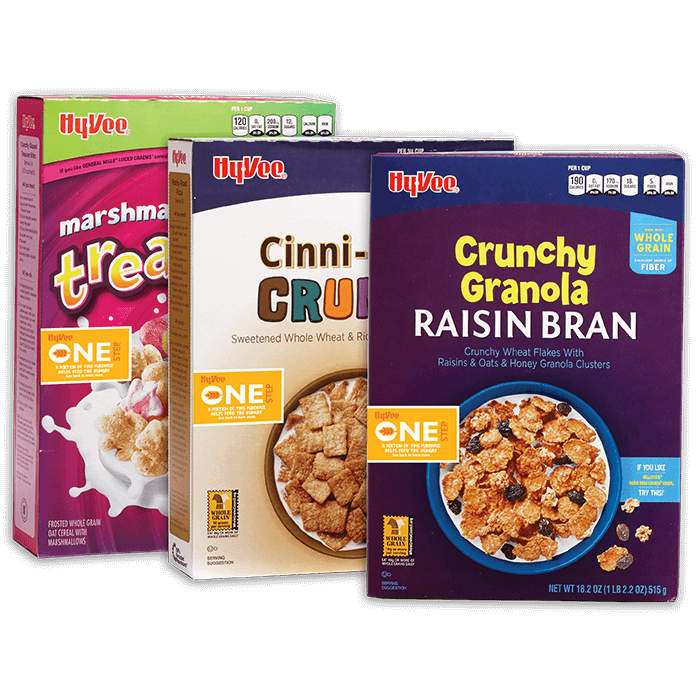 Hy-Vee One Step cereals help support Meals from the Heartland, which provides food to starving people around the world. Community gardens provide food and help teach about nutrition. 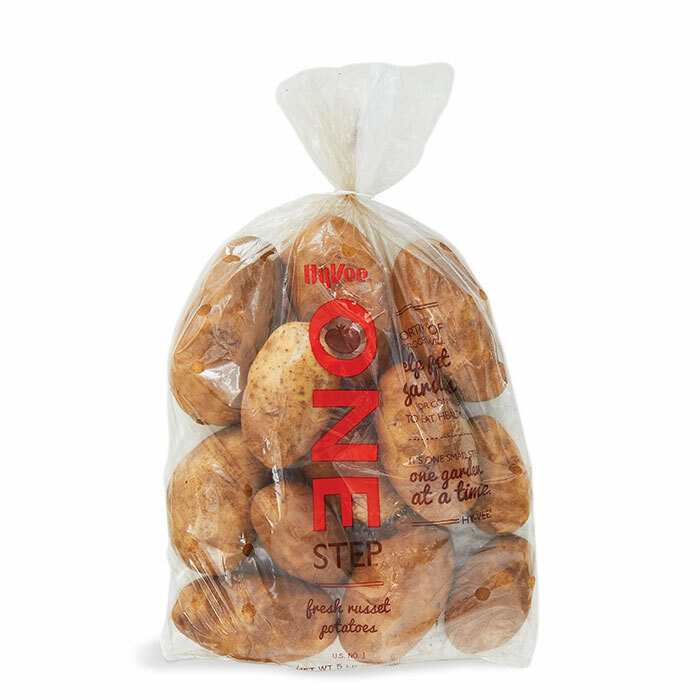 Hy-Vee One Step russet potatoes help provide grants to build them. Trees provide essential oxygen and beautify communities. 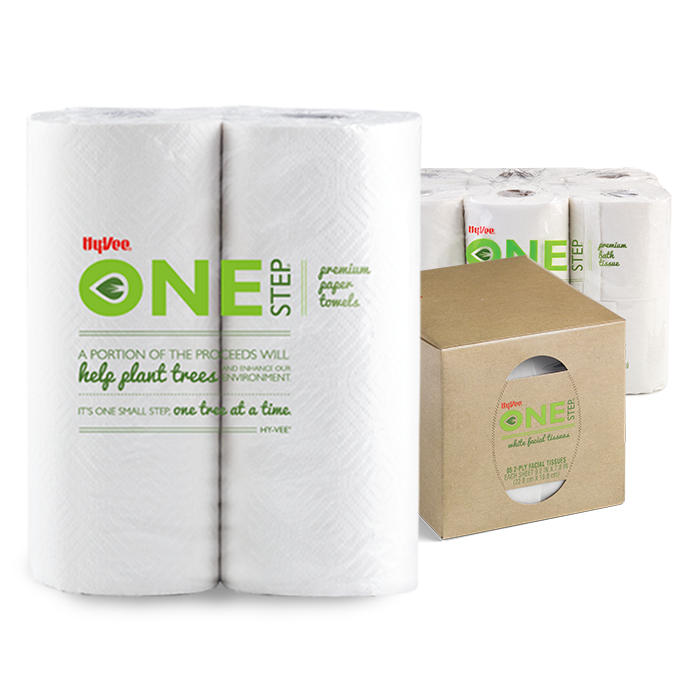 Hy-Vee One Step paper products help plant more of them. One in six people worldwide lack access to safe drinking water. 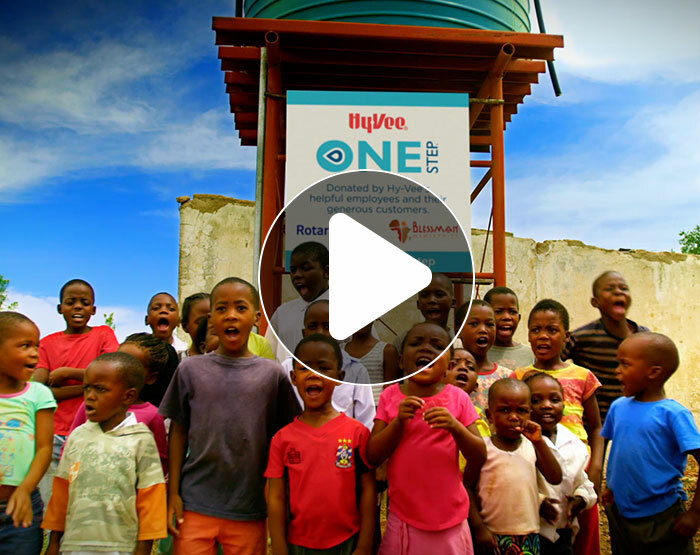 Hy-Vee One Step bottled water helps build wells to provide clean water for whole villages. Hunger is a serious problem. Millions of people, in countries around the world as well as our backyard, lack a dependable, adequate supply of food. Proceeds from One Step cereals, packaged in a 100% recycled cardboard box, will help those struggling with food insecurities. More than $72,858 has been donated to Meals from the Heartland, a non-profit organization of volunteers who package highly nutritious meals, which are transported to the needy. That amounts to roughly 364,291 meals, which have been packaged and shipped to food banks throughout the Midwest. Each meal is packed with rice, soy protein, dried vegetables and vitamins, ensuring that hungry children and families around the world get the nutrients they need. The proceeds from sales of One Step Russet Potatoes help fund community gardens that teach those in need about health and nutrition through the process of planting, tending and harvesting their own fruits and vegetables. The Amos Hiatt Community Garden in Des Moines, Iowa, was the first garden funded by a One Step grant. The experience of this garden has been used to develop a prototype that others can follow or modify to meet the needs of their neighborhoods and communities. Proceeds have helped provide funding for 740 community gardens through 2016. Every community needs the ecological and environmental benefits of trees. Trees supply two of life's essentials – oxygen and food. Beyond that, they have important practical, commercial and social value that affect a community's quality of life. Among their many attributes, trees offer clean air and shade, they lower energy costs and they provide a means of storm water control. Thanks to the sales of One Step Paper Products, which are made of recycled materials, 114,040 trees have been planted in the flood-damaged Wilson Island State Recreation area near Council Bluffs, Iowa. Hy-Vee will work with the Arbor Day Foundation to plant trees in neighborhoods, parks and other public places. The lack of a reliable source of fresh water is a global crisis. It is estimated that, worldwide, one in six people lack access to safe drinking water and two in six lack adequate sanitation. Water-related illnesses are the leading cause of human sickness, suffering and death. Hy-Vee partners with Rotary International to dig wells that will provide millions of people around the world with better access to clean water and improved sanitation. 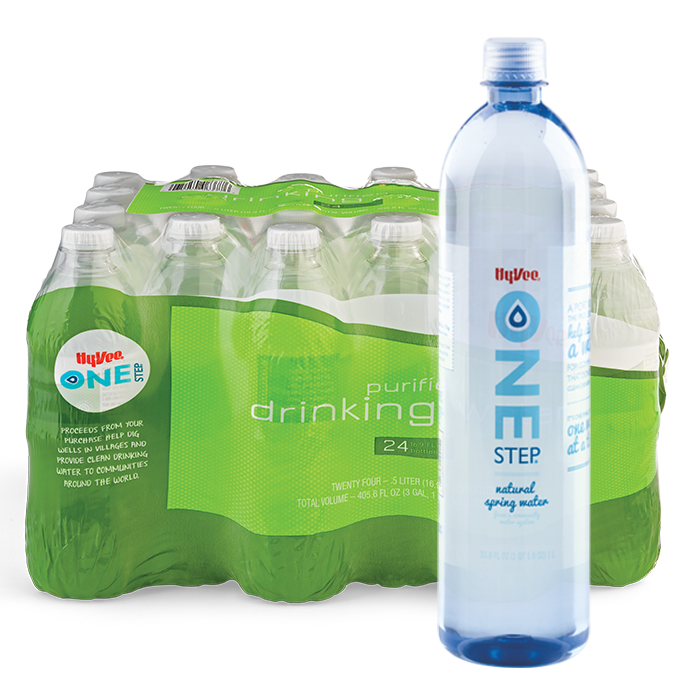 The proceeds from sales of One Step Bottled Water have led to the completion of 34 clean water projects, which provide clean drinking water to towns and villages in: South Africa, South Sudan, Lebanon, Tanzania, Nigeria, Haiti, Kenya and Chad. All One Step eggs are produced on small family farms in Southeast Iowa and Northeast Missouri. For each carton of Hy-Vee One Step Eggs you purchase, we donate a meal to a child through Meals from the Heartland.